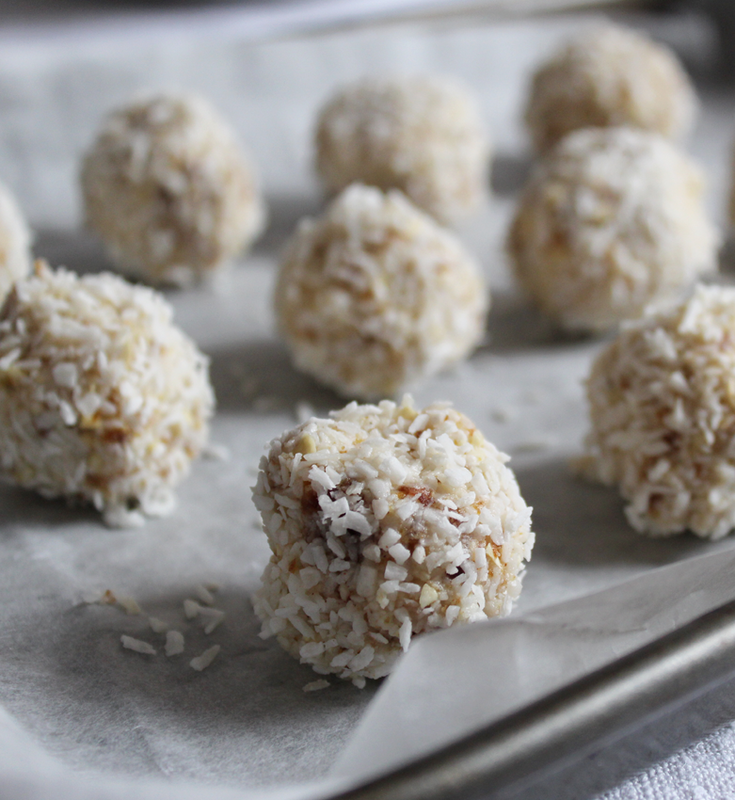 A Recipe For Cashew, Coconut & Date Energy Balls. January can be a little tough on the old soul. After the buzz and lights of Christmas it can seem a drained. Everyone seems to exist in the a constant state of remorse for each and every chocolate, piece cake and cocktail that passed their lips in December. There’s no judgement here, I’m one of those who uses January as a way to kick start a better way of eating too. Life shouldn’t be without the joy and comfort or a sweet treat, especially not come a cold January evening. That’s why these energy balls are perfect. To clarify, they won’t shrink your waist line, remove the bags under your eyes or cause you to become a supermodel over night. They will however provide a little something if your steamed fish and slippery mound of spinach hasn’t quite hit the spot. 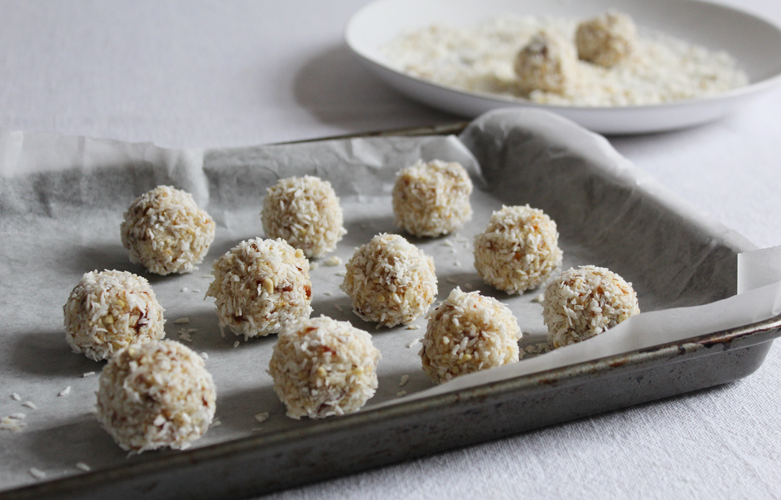 I’ve made these energy balls before with the zest of a lemon and can confirm they’re just as good, if you find yourself more inclined to sharper flavours. There’s no real science to the making of the balls; melt the coconut oil gently in a pan and leave to one side to cool. Start with your cashews in the food processor and blitz them until they form a lumpy rubble but aren’t quite ground. Add in the salt, chia seeds (if using), 2tbsp coconut, coconut oil and pitted dates. If you want to add in the lemon, grate in the zest here also. Give everything a good blitz until it starts to form a sticky rubble. 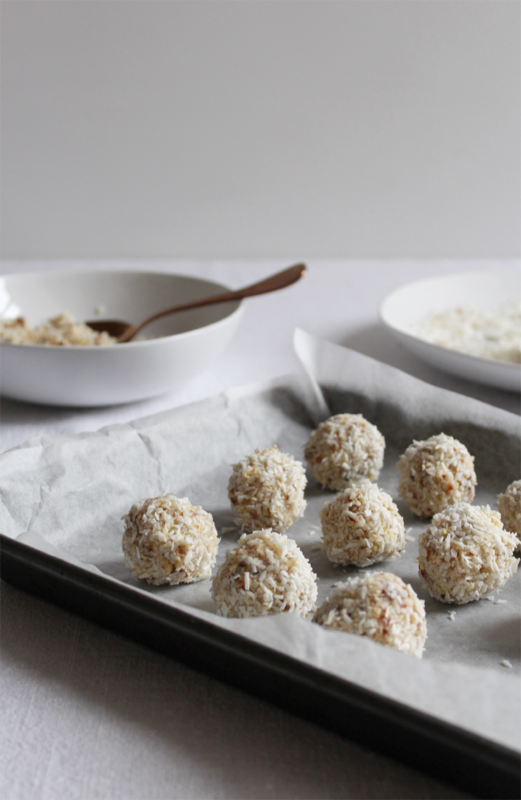 Grab two plates, on one spread out the remaining 2 tbsp of desiccated coconut and on the other top out the rubble and begin shaping it into balls by pressing tightly and rolling them in your hands. The mixture should make around 20 in total. Try to make them about the size of a large truffle. Roll each date in the plate of coconut to fully coat them. Pop the energy balls in the fridge for an hour or so before sampling the fruits of your minimal labour.